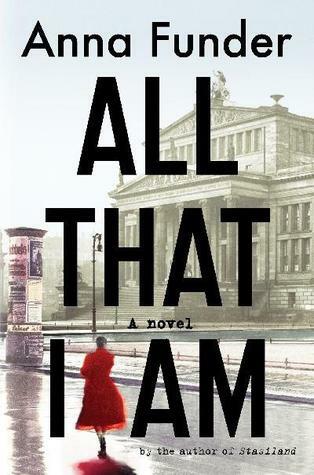 All That I Am by Anna Funder has been on my “to read” list for a long time. As the winner of many Australian literary awards, including the prestigious Miles Franklin Award, I knew this was a book that had impressed the critics. What stopped me buying it was the fact that I thought it was another sad story of the horrors inflicted on Jewish people during World War II. You definitely have to be in the right frame of mind to cope with those reads. So I put it off until I received it as a Christmas gift. And then I put off reading it a little longer. Finally, I picked it up and started reading. When I did, I realised that this was a story I didn’t know. All That I Am follows the lives of two couples – Ruth and her husband Hans and Ruth’s cousin Dora and her lover the celebrated German left-wing playwright Ernst Toller. It takes place in the years before World War II when Hitler and the Nazi party are gaining more power. Before the rest of the world realised what was going on and the political opponents of Hitler, and those activists who openly opposed the Nazis in the public sphere such as journalists, writers and playwrights, were imprisoned or forced to leave Germany – and as time went by those who stayed were not given the option of a trial and prison, but were executed or sent to camps. What makes it even more interesting is that it is based on a true story. It tells the fictionalised version of real people and real events. Ruth, Hans, Dora and Ernst were lucky enough to be allowed to take exile. They settle in London and as per the terms of their residency in the UK are told they can only stay if they do not engage in political activity. But they are compelled to continue to tell the stories of those left behind in Germany and of the friends hunted down and killed by the Nazis. They want to get countries like Britain to recognise what is going on in Germany. But they are not safe in London. There are men following them in the shadows. And the Nazis are prepared to go to any length to silence their opponents, wherever they may be. It is hard to know who to trust. In the middle of all this intrigue is the story of Ruth, now an old woman living in Australia looking back on what happened before. Her story focuses on her cousin Dora – a brave resistance fighter who had an unconventional relationship with Ernst Toller. The book is also told from Ernst’s point-of-view. I can see why this novel won so many accolades. It is beautifully written with a compelling storyline. I learnt a lot about a part of history that I didn’t know about before. I wouldn’t be surprised if someone turns this into a film. It is a story that needed to be told. A friend told me he had read this book in about 2 days, said he couldn’t put it down and he’s been bugging me to read it too for ages. I think I had some of the same reservations as you, but now I’ll have to give it a try! I’ve never heard of this book but it sounds like a wonderful read. Thank you for sharing, I’m definitely popping this on my wishlist.